I often hear COLOURlovers described as a place to help people find great colors... "Like for when you're looking for colors to paint your kitchen or bedroom." Problem is, it has been hard to take a color on our site and find a matching paint color in the real world. So, we're super excited to announce a partnership with Martha Stewart Living™ to get her paint colors on the millions of colors, palettes & patterns pages here at COLOURlovers... By far making this site the biggest color resource for paint color inspiration! I've had the pleasure of spending some time at the Martha Stewart HQ in New York city and it's like Santa's workshop for creatives. Each room is full of people making awesome stuff... pastries in this room, ornaments in that room... It's the kind of place any creative/crafty person dreams of being locked in over night. Since Martha Stewart and her creative empire are all about crafting & creating... we're thrilled to work with her and all the awesome people at MSLO. The addition of these paints to the site is going to open so many great opportunities for interior designers & decorators, and even just somebody looking to add some pop to a boring white wall. Wherever a color is displayed on our site, along with the HEX & RGB numbers for that color we'll also show you the closest matching Martha Stewart Living paint color. And every display of that paint color will link you to the Home Depot site where the Martha Stewart Living paints are exclusively sold. From the Home Depot site you can easily & affordably try out a paint tester to make sure you love the color. Note on Color Matching: Since more colors (16 Million) can exist on a computer screen compared to paint colors... Not every color on our site will be a perfect match to a paint color, but we're working hard on perfecting the matching logic so the color that you're loving here can be the color you're loving on your walls. Martha Stewart’s 280 custom colors are inspired by themes found in nature and the home. Martha Stewart Living also supports the entire decorating project through an innovative color coordination system. Symbols match color families and themes, and coordinate with other household products throughout the store like rugs, furniture, and storage. Along with adding the paint colors to the site, we'll be showcasing some of the beautiful home images from Martha Stewart in our Home Inspirations & Trends section of our site as well as some write-ups here in the blog. Having the ability to link colors we love to paint colors is really going to add a whole new layer of awesome to the site! Paint Your Space. Share It With the World! When you use this new feature to paint a wall in one of the spaces in which you live, make sure you post up a picture in the comments. We'll be showcasing a gallery of awesome painted spaces soon and I hope yours will be included. But it has been possible for quite a while now to match complete Coloulovers palettes to Benjamin Moore and Sherwin Williams paints. You can check it out at colorjive.com, but hurry because that feature probably won't last much longer. 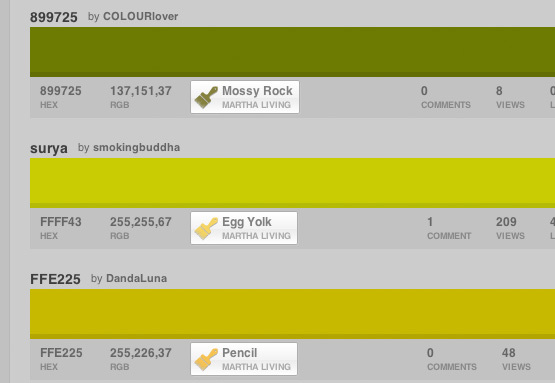 You'll find it under the tab 'Colourlovers' in Colorjive's color browser. Yeah... those little icons there are kind of annoying me. -_-; It's kinda kewl when they match up exactly, but the brighter yellow-green ones never even get close. Oh well, though. I hope this helps somebody, and it's nice to know that somebody out there cares about our spiffy site here. @rover, we're working on the matchings. And will probably knock out some of the matches that are not so close until we can improve them. Martha Stewart is a powerful lady and an inspiration to many women. I think she was the first person to sell the idea of decorating and loving the home through "homemade" projects.Of course, we don't call it homemade....it's creative projects. I think the business side of Martha made it (the it.....being that of a business woman in corporate america and a business mom in the American Family.) She revolutionized the new era of women. In a sense she is the Mary Kay of this day and age. Mary Kay just like Martha sold her feminized idea and product by being a brilliant business person. The trend of feminizing the woman again while proving that it is at no cost to the corporate woman ...and juggling the persona of a happy home maker wife cliche' in the corporate world is often very hard to be taken seriously. Mary Kay gave the lady a home business and the tools to become independent while looking good doing makeup. You have to remember Mary Kay was getting this makeup idea off the ground during the time it was frowned on for women to work. Martha gave us our(or gave us back the home notion ) home and ok to decorate it from creative pieces of your life. I really loved this comment and review / comparison to then and now. Makes me want to look in to it more. I am SUPER excited about this addition as I have used her line for the first time this last spring on my kids rooms (finally had a painting project that called for it). There were many (MANY) points as to why I would definitely use her line again and most definitely always use it as a first choice. The symbol system is genius and made absolute hue matching much less of a headache and I felt confident that putting more than 1 and even 2 colors in a single space - they would really mesh (because of her system). The paint itself is amazing to apply (nice and thick but not annoying to apply with rollers or paintbrushes). about three years ago I had an opportunity to attend a conference at the Mary Kay corporate head quarters in Texas. Not only was it just a makeup seminar and awards conference for all the reps of Mary Kay, it was a business principle and hands on product development. It will blow your mind at how well orchestrated and how well managed that company is. Mary Kay sold books door to door while her first husband was in the war. Upon his return they decided to go into cosmetics. The initial investment was like $5000. At the time she came up with this she was working for Stanley Home Products and was passed over a promotion because she was a woman. At time of Mary Kay's death she had turned that $5000 investment into a billion dollar company. Mary Kay Cosmetics had over 800,000 representatives in 37 countries, with total annual sales over $2 billion at retail. As of 2008, Mary Kay Cosmetics has more than 1.7 million consultants worldwide and wholesale volume in excess of 2.2 billion. Mary Kay herself was honored as leading female entrepreneur in American history. 2008 are the last numbers I remember because that is when I went to the seminar. She founded all these numbers on two things and those two things turned into her slogan and her foundation. 1.allow women to advance by helping others to succeed. She advocated "praising people to success"
2. and her slogan "God first, family second, career third" expressed her insistence that the women in her company keep their lives in balance. ...and today the company still operates and exists off the same belief. I was totally just blown away...One of the best seminars on business and motivation I have attended. Mary Kay is a lot more than make up....it was a way of life and it was more about giving the confidence to women to sell themselves and promote their ability through believing in themselves. A little different in comparison to Martha Stewart in an ironic way. Mary Kay helped to bring about the changes of women entering in the work place. (Because at the time of Mary Kay ...women were more figures of the home. Background people..per say. Martha Stewart took it to the level of bringing the home back into the corporate level and selling the fact that you can juggle both and be proud to say that you are creative enough to cook, do home projects and enjoy being home. Both women celebrate success for basically the same principle and both have changed a stereotype and industrialized two different types of women into one. I had never really thought about them two together until other day.I think women have had to do more emerging and changing than men and both Mary Kay and Martha Stewart did it at times that were controversial pivot points. I think it's more about getting to a place where your comfortable and being able to sell yourself...your whole self... not just part of you. Mary Kay may have sold make up and Martha Stewart sold her ideas of creativeness....but that was just the by product of what you are actually getting. It's a belief. It's always better to believe...because without it nothing will be achieved. Matter of fact...the year I went to the seminar that was the slogan for that year. Believe. ...and with that anything is possible. It's really that simple. I forgot to add that Mary Kay is also listed as one of the top 100 places to work. It's still family owned today. Glinda you're amazing!! You always knows so much! Maybe you could blog here? Congrats Darius and CL team! Please don't show my wife the green kitchen- it might mean an overhaul of our kitchen! I don't have a credit card large enough! I saw Green canisters like that in a vintage shop last month for $400. So maybe I'll start with a green plate. So I am not the only one who found the mismatches to be annoying. I can honestly say I have never been a Martha fan. 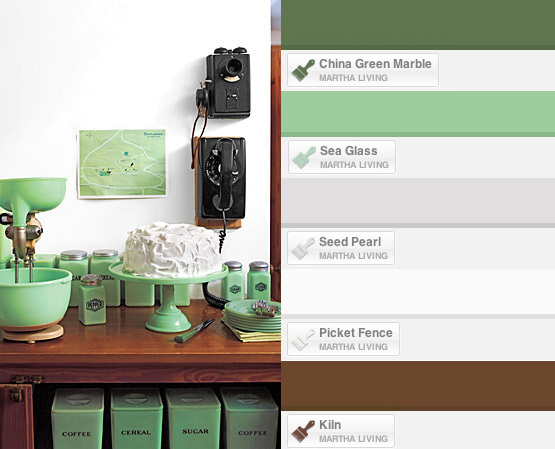 Martha has this thing for that shade of green I can not stand.... Any way, the idea itself is cool if you are looking for a paint color. It's too bad users can't turn it off and on so when they want it's there to use.